The turkey may be good, but I recommend the all-you-can eat seafood! A staple of my fall birding activities is scoping area reservoirs for interesting waterfowl, waterbirds, and gulls. As I was waiting out a Parasitic Jaeger between bouts of chasing gulls the other day it occurred to me how different fall Podiceps grebes showing non-breeding plumage are in comparison to their showy breeding plumages. When they are colorful, there's no mistaking Colorado's two abundant fall Podiceps, Eared and Horned Grebes. But when they are wearing their winter grays, they are amazingly similar in appearance and all to often just glanced over. Some of the best advice I've ever received about finding rare birds is to identify every bird, even the common ones. When you are competent and confident with the common ones, unusual birds (in this case, say, a basic Red-necked Grebe) will jump out at you instead of staying lost in the crowd. 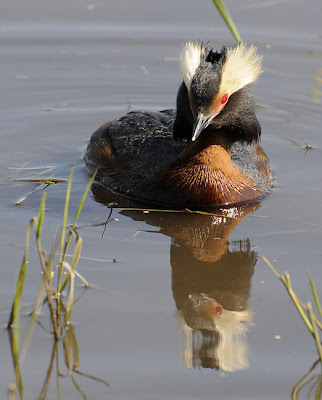 Breeding Eared Grebes (above, Colorado, April) have all black necks and wispy yellow plumes that radiate out from the eye area. 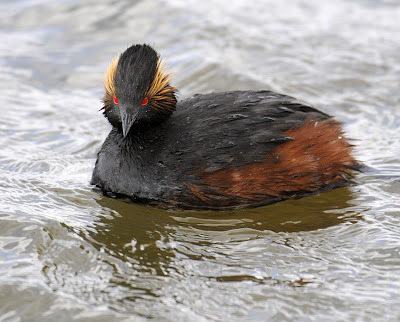 Note how dark feathers can be seen through the plumes, and the sharp crest atop the head. 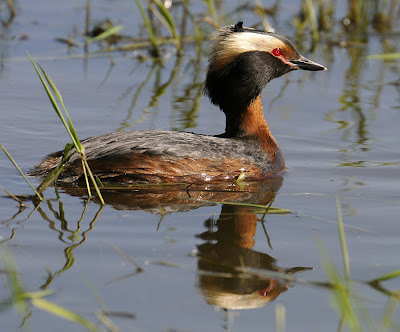 Breeding Horned Grebes (below, North Dakota, June) have a solid yellow swipe of feathers going back from the eye, a flatter head, a rufous neck, and a little white tip to the bill. No problemo, you say? The problemo is that these birds now show a very similar pallate of white, gray, and black in about all the same places when in non-breeding (basic) plumage. 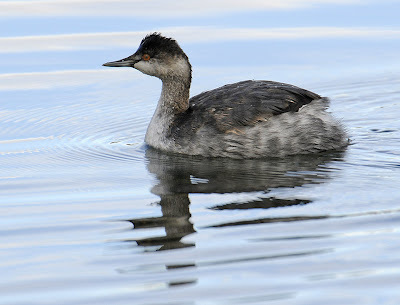 Structure can still be helpful, as Eared Grebes (below, Colorado, November) typically show a more domed head than Horned. Note also the blurry-looking border between the dark cap and the light neck. Also note that darkness extends behind and below the eye (feathers known as auriculars.) 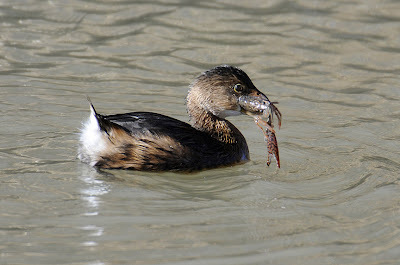 Eared Grebes are often willing to forage near the edge of lakes, particularly along rocky shores. They can also be seen far from shore, though. 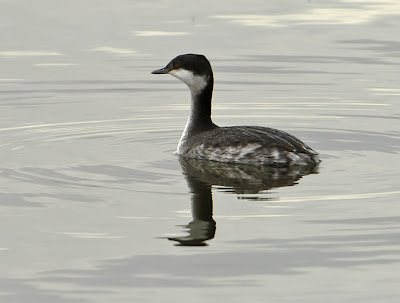 In contrast, winter Horned Grebes (below, Colorado, November) have a more sharply defined dark cap and the eye is right at the edge of the darkness, with white below and behind in the auriculars. 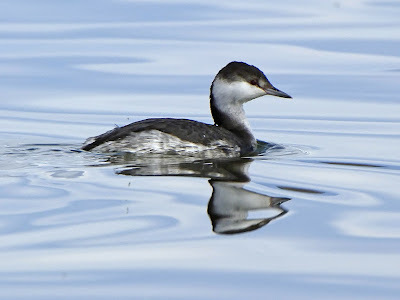 Their heads almost always look flatter than Eared Grebes', and most of the time there is a white spot on the lores (feathers in front of the eyes.) If you get a good enough look, you will see that the white bill tip is retained in the winter. 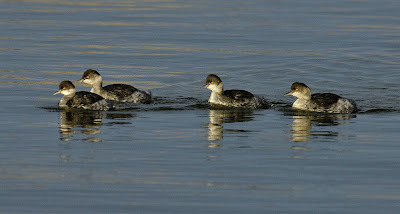 To me they look somewhat like dwarf Western Grebes in their basic plumage. 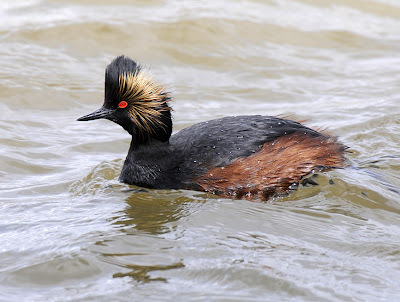 It occurs to me like seeing Horned Grebes near shore is much rarer than with Eared Grebes. Ready for your quiz? Which is which below? The left bird is a Horned Grebe while the right bird is an Eared Grebe- how'd you do? ?